In 1918, Frank Mazzuca opened a small shoe repair shop located in the vicinity of the present day Legion building. In 1920 the Drago's block was built across the street at 37 Young Street by Frank's brother-in-law, Joe Drago and Frank moved his business across the street to this new location. The business soon evolved into a general store. Some years later Frank Mazzuca purchased the building from Frank Drago but the business retained the name Drago's because Frank's brother, Fiore, was also a Capreol businessman, and since both brothers' names started with an F it seemed prudent at the time to differentiate between the two F. Mazzucas in this manner". 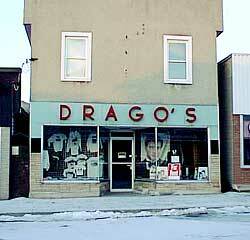 In l925 Frank Mazzuca married Mary Ann Destefano and together they operated Dragos. While doing so they had time to raise two children, Edward and Rudy, the latter of whom managed the store with his mother after Frank's death in l953. After Mary Ann's death in l965 Rudy became the sole owner and manager of Dragos Department Store. By this time the retail establishment had lost its general store appearance and began to specialize more in mens clothing and shoes for the family. It remained this way until the summer of l998 with Rudy"s retirement. For eighty years, Dragos served the people of Capreol and is now a significant chapter in the town's history.